Do you feel like we do? If so, this Blu-ray is for you. Presented by Eagle Rock Entertainment, FCA! 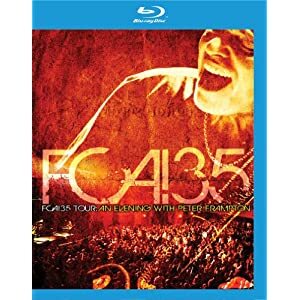 35 Tour: An Evening with Peter Frampton includes footage from the icon’s 2011-2012 world tour in celebration of the 35th anniversary of the legendary Frampton Comes Alive! record. The release is available in a two-DVD set and on Blu-ray, while a three CD set entitled The Best of FCA! 35 Tour is also out. This review is for the Blu-ray release. Directed and produced by Pierre and Francois Lamoureux, FCA! 35 Tour features footage from two shows from February of 2012. Material from a New York gig at the Beacon Theatre is combined with footage from a Milwaukee show at the Pabst Theater. Indeed, the year of shows was a special one. At each tour stop, the good-humoured Frampton and his band played through two sets. The first encompassed the entirety of Frampton Comes Alive! and the second delivered other goodies from his extensive career. And of course, after baking through an eight-minute version of “Jumpin’ Jack Flash,” Frampton and Co. launch into the fabulous “Do You Feel Like We Do.” He takes to 20 minutes of the hit with a big smile, exchanging knowing looks with band members and grinning at the excited (and responsive) crowd. It’s a tremendous moment and an awe-inspiring song. Arthur does some great work on it and an animation from The Simpsons plays on the video screen briefly before Frampton teases the Milwaukee audience with the Talkbox. After taking a bow to conclude the Frampton Comes Alive! set, the lads jump back in to the second set with “Asleep at the Wheel” from Thank You Mr. Churchill. Featuring a Blair Masters synth introduction, it seems the ideal way to kick of the second part of the release. Frampton heads through other tracks like “Restraint” and Double Nickels,” even delivering with the banjo uke on “Vaudeville Nanna and the Banjolele.” Another highlight is Frampton’s take on Soundgarden’s “Black Hole Sun,” an (mostly) instrumental version from his Fingerprints record. The Blu-ray version includes a bonus feature that details Frampton’s “reunion” with his long lost Gibson Les Paul. Featuring Frampton and the “Phoenix benefactor” Marc Mariana, the story is a fascinating and humorous one. FCA 35! Tour: An Evening with Peter Frampton is presented on Blu-ray in 1080p high definition with lossless DTS-HD Master Audio 5.1 or uncompressed LPCM 2.0 audio options. There are not a lot of stage effects to draw out the high definition, but the imagery is crisp and the darks are quite nice. The audience noise is a lot more audible in the 5.1 surround, as one might expect.